CHARLESTOWN, Nevis, May 26 2013 (IPS) - When it comes to generating clean energy and reducing costs, the tiny Caribbean island of Nevis considers itself the leader within the nine-member Organisation of Eastern Caribbean States (OECS). But the island of 12,000 residents is finding it difficult to convince other islands to buy into its model. 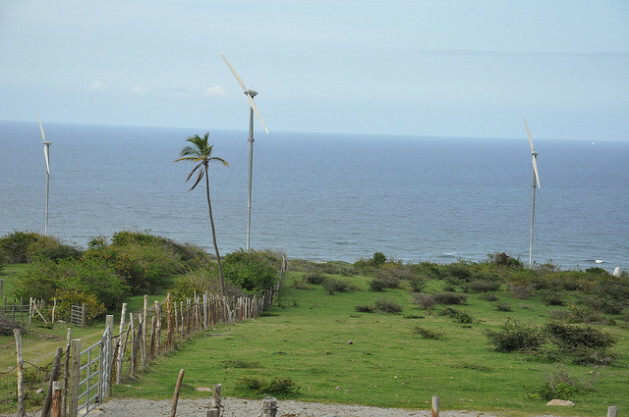 In 2010, the 13-kilometre-long island launched the first-ever wind farm to be commissioned in the OECS, with a promise to provide local jobs, a reliable supply of wind energy, cheaper electricity and a reduction in surcharge and the use of imported oils. “The fossil fuel, the diesel that the Nevis Electricity Company (NEVLEC) uses, I think it’s somewhere in the region of about 32-33 cents per kilowatt. We are selling them power for less than half of that so the numbers will add up that there must be considerable savings to the consumer,” Dexter Bowrin, director at WindWatt Nevis Limited, told IPS. The WindWatt Wind Farm (WindWatt Nevis Limited), an independent power producer, is a joint venture between Canadian and Nevisian firms which commenced operations in 2010. The company has secured a 25-year contract with NEVLEC, the state-owned electricity company, to produce and sell it power. It uses eight wind turbines to produce a maximum capacity of about 2.2 megawatts, which works out to approximately 20 percent of the tiny island’s total energy needs. But in spite of what company officials say is clearly a success story and a desire to “expand and set up wind farms in other Caribbean countries”, Bowrin told IPS Nevis’ neighbours are not lining up to go the route of wind energy. “We would love to expand but that’s not left to us. We’ve gone to several of the other islands as close as St. Kitts, down to St. Lucia and St. Vincent trying to sell the idea. However, it has not been an easy sell,” he said. He added that there is usually a misconception that if you set up a wind farm, it will be a financial windfall, but “it doesn’t really work like that”. While wind energy is not catching on that quickly in the Caribbean, most countries in the region have either expressed a desire to or have invested in solar energy. Earlier this month, the Dutch Caribbean Community (CARICOM) country of Suriname announced that it would invest in solar energy to bring electricity to remote communities. Gunzi, a Maroon village in the upper Suriname River region, will serve as test site for the project. Alternative energy company WTEC from the United States was contracted to execute the project, in close cooperation with the Ministry of Natural Resources, national electricity company EBS and the Anton de Kom University of Suriname. More than three-quarters of Suriname’s landmass is blanketed by thick rainforest and most of the country’s inhabitants live in the capital Paramaribo. As a result, several villages in the sparsely populated hinterland have not been hooked up to the EBS grid and make do with noisy diesel-powered generators that are only switched on at night. Natural Resources Minister Stanley Betterson underscored that bringing electricity to the remote villages will benefit education, industry and development of these areas. Last month, the government scrapped a proposal to execute a hydropower project in the hinterland. The TapaJai project would call for submerging 240 kilometres of land along the upper Suriname River and installing a new series of turbines which would ultimately generate 275 megawatts of power. Residents of the surrounding Maroon villages objected to that project. WTEC Director Brian Singh said solar energy is a cost-effective alternative, as Suriname has plenty of sunlight and the prices for solar panels are dropping worldwide. Singh announced that his company was donating the 75,000-dollar plant that will be set up as a pilot in Gunzi. University students will monitor the Gunzi project for a year and their findings will be used to optimise its use and execute the project in other villages. Environment Coordinator John Goedschalk said that government is investing in an in-depth research to find the ideal mix of alternatives to supply energy. He said the criteria for this mix are accessibility, cost effectiveness and least impact on the environment. Bowrin told IPS concerns for the environment were also at the forefront of the minds of the principals of WindWatt Nevis Limited noting that, prior to the commencement of operations, an Environmental Impact Assessment was done to determine the noise level and other impacts on the environment. “We didn’t just put up turbines. We leave a very small environmental footprint. The eight turbines that we have in place we are only using two and a quarter acres of land and we still have the flexibility or the ability to have cows and other animals grazing in the area,” he said. Cognizant of the yearly hurricane season which runs from June to November, Bowrin said the two-blade system turbines are very small and it takes only 40 minutes to take one down. “We monitor the weather on a daily and weekly basis so in the event of a hurricane approaching we would have the turbines down in a couple of hours and it’s just as easy to put them back up,” he said. “The Nevis Island administration has demonstrated its commitment to using sustainable and renewable energy through continued investment for geothermal energy and wind energy,” Premier Vance Amory told IPS. With its working wind farm, a series of solar panel projects, and a planned geothermal project, St Kitts and Nevis has been among the region’s green energy pioneers. While the geothermal project has experienced delays, Prime Minister Dr. Denzil Douglas said current projections foresee locally-generated geothermal energy “in two years”.